Grizzly T26516 - Metric Drill Bit Set, TiN Coated, 25 pc. Titanium nitride-coated bits last up to six times longer than uncoated bits. Set ranges from 1mm to 13mm by 1/2mm and is housed in a rugged steel case. Hello, I am so pleased with my purchase. 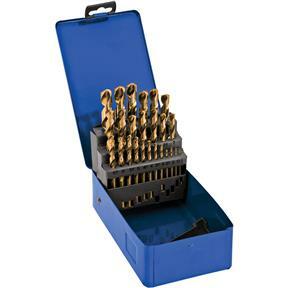 An excellent set of bits at a really good price and I recommend that all woodworkers have them for their tool sets. Good for the in between size that always seem to crop up as well as their metric size! I do not normally have a need for metric sized drill bits, but this offering was too tempting to pass up. Having these metric sized bits available for the rare occasion when I might need them was enhanced by their competitive pricing. I have never been disappointed in my dealings with Grizzly as they always seem focused on meeting customer expectations. I have never had a qualm as to their business integrity.